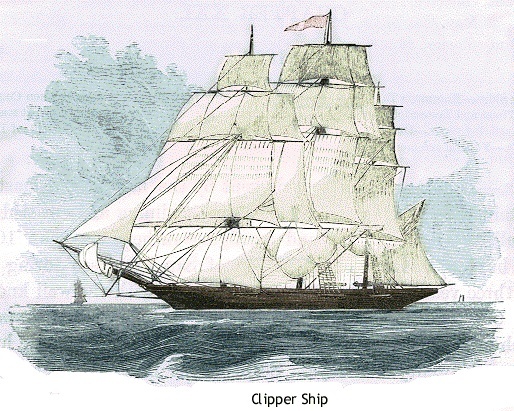 The Clipper Ship expanded world trade with its speed. MARCH 1854--San Francisco is passing through a time of much mercantile distress. For many months before this period, commercial business had been unprofitable to those conducting it. We have already alluded to the circumstance that an excessive quantity of goods had arrived during the latter part of 1853. In the spring of 1854, importations continued very large. The market was completely glutted, and prices of the great staples of commerce fell day by day. Several bankruptcies ensued, and the whole commercial community were suffering severe losses. The clipper ship Bald Eagle, and some other vessels, were fully freighted to New York and other eastern ports with goods similar to those they had recently brought from thence. Besides the general lack of business and low prices of merchandise, one great cause of commercial losses here was the high rents charged for stores and general business premises. During 1853, an unusually large number of expensive fire-proof buildings had been erected, which at first were in great demand at much increased rates. When sales and prices of goods fell off, dealers could no longer afford to pay the raised rents. It was found, at the same time, that builders had been largely anticipating the natural demand for business accommodation, and had erected far more houses than could be profitably occupied. Soon the large number of empty stores forced owners of house property to reduce rents from twenty to thirty per cent; at which reduction not many more tenements were occupied than before. All this while, as building was briskly going on and rents were rising, the marketable value of all kinds of real estate was greatly enhanced. Unimproved lots, within a wide circle round the settled portions of the city, became suddenly in demand, at many times their recent price. Speculation in real estate was rife, and holders who had the prudence timeously to sell out, realized large sums. Many people thought that surely the advance could not last, but it did; and prices still continued to rise. Had trade been good, it is hard to say how high and how long the increased prices, great part of which was certainly without just cause, would have gone on; although doubtless the reaction would have come by and by. The bad condition of commercial affairs, and the reduction in store rents, hastened the downfall. About the close of December, 1853, at the time of the great sales of water lots, prices of real estate were about the highest. Two months later, unimproved town lots were almost unsalable at any price, while house property suffered a fall corresponding to the reduction in rents. This led to the failure of a few speculators in real estate. Looking, disinterestedly, at the great extent of ground around the city still unbuilt upon, the number of empty stores, the acknowledged overdoing of commercial business, and, above all, the comparatively slow rate at which, of late, the population of the State and city is increasing, it appears to us highly probable that many years will pass before the recent high prices be again witnessed. Most likely, the present reduced prices for all kinds of real estate, but more particularly for unimproved lots, will continue, for some months, to fall lower. When the population of the State, and by consequence that of its great port, are materially increased, prices of real estate in San Francisco may be expected to rise far above the present or even the recent high rates. While there seemed not much hope for any rise in the value of real estate for a long period, prices of merchandise in the latter part of this month began slightly to improve. The prospects of a general European war, and, the expected diminution of shipments from other ports to San Francisco, as well as the increasing production of gold at the mines, led to the belief that, before long, the commercial market would, at last, become again profitable to merchants. All mercantile communities are subject to occasional depression, but these in the end work their own cure. In the instance before us, the chief loss would fall, not upon the general inhabitants of San Francisco, who only got their merchandise cheaper, nor even on its many commission merchants; but on the foreign shippers who willfully and recklessly continued to flood our market with goods that were not wanted at the time.